This ad in a local paper attracted my immediate attention. 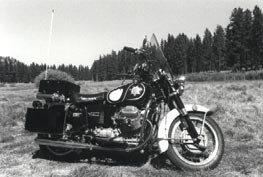 I had been considering a motorcycle restoration project to keep me occupied during our long Lake Tahoe winter. Several people suggested a "Harley," but I wanted something different. A phone call to the number listed in the ad resulted in a meeting scheduled in Placerville - 60 miles away. As my wife and I arrived, I gazed upon what can only be described as a "rolling basket case". The bike displayed minor damage along with dirt, leaves, cobwebs and other testaments to the fact that the bike had been sitting for a long time. The owner had the bike loaded onto the bed of his pick-up truck and was obviously intent on selling and delivering the bike that day. Various parts were strewn in the bed of the pick-up and, although it had obviously suffered the effects of an uncaring owner, there was something about the bike that piqued my interest. Maybe it was those huge cylinders angling out from the sides of the bike; maybe it was the full-fendered "big bike" look that seemed to hint that this machine could transport its rider in comfort and style - if only it could be restored to its original splendor. I negotiated first with my wife Linda, who is (thankfully) inclined to indulge me in my idiosyncrasies and follies. She agreed to the purchase, and after some friendly bartering with the bike's owner, we were the proud owners of 500 pounds of non-functioning metal. I knew a CHP mechanic, Pat Hambel, who offered to help me get the bike running. After considerable effort, we were able to break the pistons free and get the engine to turn over. 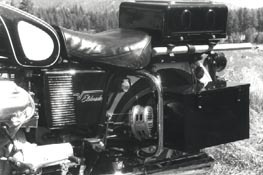 The engine ran well - on one cylinder. Pat, recognizing that this project could turn into an ordeal, bowed out and suggested I call Steve Payne. Steve outfits CHP motorcycles at the CHP Motor Transport Section in Sacramento and operates a business called Payne's Classic Motorcycles on the side. 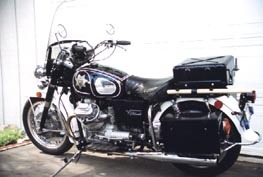 Steve asked questions about the Guzzi and, based on the description I provided (foot boards, heel-toe shift, large speedometer, large side stand and a curious bracket on the left side of the swing arm), he determined that the bike sounded like an old police model. He explained that the bracket on the left side was the mounting point for the siren. He offered to check the bike and advise me on its general mechanical condition. I left it in his care and began to consider what course this restoration was going to take. With a former police bike as a starting point, why not restore it to its original police configuration? As a 22 year law enforcement veteran who has a passion for motorcycling, the restoration of a police bike seemed to me the perfect melding of my vocation and avocation. A letter to CHP Commissioner D.O. Helmick yielded a quick response with the Commissioner both sanctioning the restoration and offering CHP assistance. Authorization letter in hand, I contacted "Bo" Bohannon at the Motor Transport Section, and he provided me with an old Motorola motorcycle radio control head (the unit that mounts on the handlebars) and CHP star decals for the gas tank. The control head was a relic he'd salvaged years earlier. It was sitting on his desk He explained that the Motor Transport Section had recently moved to its present location. Prior to the move, all the old surplus CHP motorcycle junk (translation: everything I needed) had been trucked to the scrap metal yard. In the meantime, Steve Payne called with discouraging news. He said the engine was serviceable - as a boat anchor. After listening to his dissertation on the evils of chrome fragments and their insidious effects on engine parts, I agreed to a complete engine rebuild. I'd considered testing my mechanical abilities on the engine, but the Guzzi service manual lists 24 specialized tools that all look like implements used in a torture chamber - and I had none of them. So, Steve was commissioned to breathe new life into the old bike. Steve's business card advertises "Precision workmanship, Quick turn around, Low prices - Choose any two." Having more time than money, I deleted the "quick turn around" option. Wanting to be as correct as possible in the restoration, I needed to find out exactly how the CHP Moto Guzzis were outfitted in the early 70s. I visited John Hoppe at CHP's Motor Transport Section. John was the "old timer" at the CHP and remembered the Guzzis. He explained that in the early 70s, the CHP purchased Honda 750s, Moto Guzzi Eldorados and Kawasakis in their quest to find a replacement for the venerable Harley. They finally opted for the Kawasaki. (Go figured, but CHP Guzzis logged many miles on California highways.) John even had some old black and white photos of the Guzzis. He photocopied the pictures for me. with those authentic photos and I now knew how my restoration was should eventually look. With the engine work underway, I stripped the bike down to the frame and had all painted surfaces powder coated. Some of the shiny things were in dire need of plating so off they went to the chromer. The forks were in bad shape so Ed and Joe at "Dyna Reno" rebuilt the front suspension while I ordered new shocks for the rear. The long Tahoe winter was perfect for "inside" work and Linda and I spent many snowy days cleaning, polishing and rebuilding parts. During this entire process, I was on a mission to locate police motorcycle emergency equipment (red lights, siren, radio box, side boxes, etc.). John Hoppe located a pair of metal side boxes at the CHP office in Torrance, California. The boxes, fabricated by prison inmates years ago, were being used to hold tire chains for CHP patrol cars. John commandeered the boxes and shipped them to the Sacramento Motor Transport Section with my name on them. Thanks John! 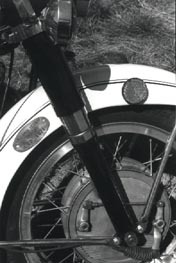 The siren used on CHP Moto Guzzis was a mechanical Harley-Davidson "growlet" type that utilized a kick pedal to pull the siren' s drive shaft into contact with the rear tire while the bike pursued errant motorists. Very few are left, but I was able to locate one at a swap meet at a Reno motorcycle shop. 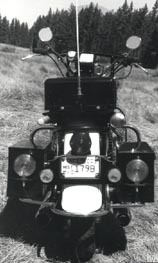 The really elusive piece of equipment was the Motorola "radio box" that mounts to the rack above the rear fender. A year and a half search for a radio box had yielded nothing but frustration. Then, one day, my wife (who also works for the Sheriff's Department) had occasion to talk with Jim Walshaw, an Investigator from the Amador County District Attorney' s Office. Linda casually mentioned my restoration project and Jim casually mentioned that he had been Jackson Police Department's one and only motorcycle officer during the early 70s. Jim promised to check and see if any of the equipment from his "motor" had survived the past two decades and promised he would call if he was successful. True to his word, Jim called and said he'd found his bike' s equipment in the City's "Corp Yard". There, in an outbuilding, he located his bike's control head, complete Motorola radio, and, yes, the radio box! The box was being used to hold loose pans, bolts and debris. He delivered it to Linda who relayed it to me, and I was now much closer to having a complete CHP motorcycle! After powder coating, chroming, rebuilding and polishing, the re-assembly process began. Gosh! What a great feeling it is to see the object of your sweat and toil finally begin to take shape! Steve Payne and I refitted the engine and transmission to the bike and fired it up. What glorious motor music was emitted from that twin - even if the mufflers weren't yet affixed! Steve was able to procure red lights, a radio antenna and a pair of old "Dietz" rear turn signals. I had the siren's kick pedal fabricated (Let me know if you have an original.) and it all went together with relatively few problems. 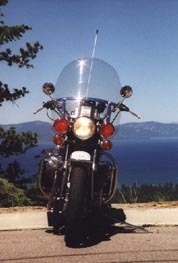 In June of 1998, Linda entered my bike in the next year's "Harleys at the Horizon" bike show in South Lake Tahoe - scheduled for June of 1999. I think she wanted to give me some incentive to complete the bike in a reasonable amount of time. I completed the restoration in May and rode the bike through South Lake Tahoe to the show. You should have seen the looks the bike got! It received even more attention at the show and, when it was all over, the old Guzzi was bestowed the "Best Non-Harley" award - to a rousing round of applause from the audience! One of the most rewarding aspects of this odyssey was the people I met along the way. The CHP guys were all great. Frank Wedge sent me my first Guzzi part. John "BY' Schwartz provided technical advice, parts (some at no charge! ), and words of encouragement. Thanks, John, for all your help! Joe Albright, an LAPD motorcycle mechanic, sent me an Eldorado service manual from their archives. Jim Bauman, an ex-CHP Moto Guzzi motorcycle officer, sent me his CHP Eldorado "Rider's Handbook" that he'd kept all these years. And others - too numerous to mention - gave me tremendous support and encouragement. Those people are testament to the brotherhood of motorcyclists - people who share the same passion and are willing to go out of their way to help if they can. To these people I send my most sincere thanks. To any of you considering a motorcycle restoration project, I warn you: There will be frustration, anxiety and impatience but it will ultimately be very rewarding - in terms of the finished product and in the friends you make along the way. To any of you interested in attempting a police bike restoration, call me. I've gathered a bit of information on the subject and would be happy to share my knowledge, support and encouragement with my Guzzi friends!